Research indicates that the weighted horizontally directed hip thrust is an effective exercise for the muscles of the posterior chain – glutes, hamstrings, calves and back – that can be used to improve performance in the weight room and on the playing field. Hip thrusts have been shown to improve lifting performance in the squat and dead lift in the weight room and enhance acceleration when sprinting across the gym, around the bases and to the ball. As effective and important as hip thrusts are, most beginners should not start with such a difficult exercise. A safer and more effective approach is to start with a low-intensity, high-reward exercise that targets the same muscles in a similar movement pattern such as the glute bridge and gradually progress through a series of more difficult exercises. Following a sequence of progressively more difficult exercises will help ensure that athletes are adequately prepared to perform an advanced, high-risk / high-reward exercise like the hip thrust. The following is a safe progression from double-leg to single-leg non-resisted lifts to double-leg resisted lifts. Glute Bridge. The first exercise in the progression is designed to teach athletes the basic neuromuscular movement pattern required to perform a hip lift. Proper foot placement and spinal alignment are not only keys to performing this basic bridging exercise and are a common theme throughout the entire progression. The athlete starts by lying on the floor in a supine position with the knees bent and feet flat on the floor. Both arms should be along the sides with palms down. The feet should be no wider than hip-width and the toes should be pointed straight or slightly turned out. Turning of the feet slightly outward will ensure greater recruitment of the glute muscles. Maintaining proper spinal alignment (pelvis tucked and core braced), the athlete pushes into the ground through his feet to lift the hips off the ground in a bridge position until the knees, hips and shoulders form a straight line. The bridge should be held for a couple of seconds before slowly returning to the starting position. Avoid over-extending hips as this can increase the pressure in the lumbar region, especially when performing weighted bridges. o The power from all progressions of this exercise should come from the glutes. Be sure to contract them at the top of the movement. o Keep your feet underneath your knees in double-leg versions and foot underneath the knee in single-leg versions throughout the exercise. Avoid placing the feet or foot too far out in front of the body. o Keep core tight and the heel(s) firmly pressed into the floor throughout the movement. Single-Leg Hip Lift. Once an athlete demonstrates the ability to perform the glute bridge with proper spinal alignment and overall positioning, he/she can progress them to the single leg hip lift. The cues remain the same as the glute bridge, except that the athlete performs the exercise with a narrower single-leg base of support. This exercise provides the stimulus needed to produce the additional increases strength in the glutes, hamstrings and core needed to progress to weighted versions of the exercise. The athlete starts by lying on the floor in a supine position with the left knee bent and the right foot flat on the floor. The left leg is raised so that it is in line with the right thigh or placed straight up in the air. After setting the core, the athlete keeps the left leg elevated and pushes through the hips until there is a straight line through the right knee, hips and shoulders. The hip lift should be held for a couple of seconds before slowly returning to the starting position. After performing the prescribed number of reps, the athlete switches legs and repeats the exercise. Elevated Hip Lift (Double- and Single-Leg). The next two progressions are performed with both or one foot elevated. Elevating one foot or both feet increases the difficult of the exercise by placing more stress on the glutes and hamstrings. 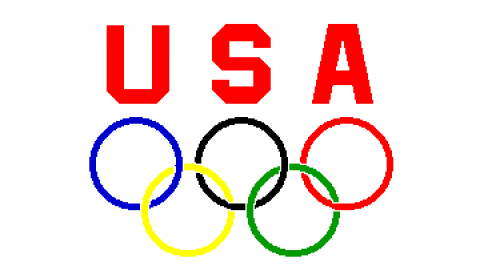 The athlete starts by lying supine on the floor with both feet placed on a small 6-inch step or box. Set the core, squeeze the glutes and push through both feet at the same time to raise the hips until there is a straight line from the knees to the hips to the shoulders. Pause, then return to the starting position and repeat for the prescribed number of reps. Keep the pelvis tucked and the spine straight throughout the movement because it is relatively easy to overextend the spine when the feet are elevated. Keeping your core tight makes it harder for you to arch your back, minimizing the stress on your spine. Trade the bench for stability ball or TRX to increase muscle recruitment throughout the body to maintain stability and balance. The more muscle fibers you recruit, the more muscle mass and strength you can build. When an athlete can perform the double-leg version with perfect technique, he/she can progress to the single-leg version. Weighted Double and Single Leg Hip Lift. When proper hip and core strength levels have been achieved athletes can safely progress to a weighted version of the double and then single-leg version of the hip lift. Start in a supine position on the floor with a 5 to 10-pound weight plate across the hips and held in place by both hands. Once the athlete is comfortable with the weight plate, he/she can use a DB to for additional resistance. The athlete starts as in the non-weighted double leg variant, except that a DB is placed with the handle facing the athlete in a comfortable place at the top of their hips. Holding the DB with one hand on each side to ensure safety, the athlete performs a series of hip lifts. Keep the core tight to prevent overextending at the hips. The single leg version differs from the double-leg version primarily in the placement of the DB. The DB is placed onto the top of the hip that will be performing the movement and held in place with one hand on top. Weighted Double Leg Hip Lift (Barbell). The last exercise in the hip lift progression is the barbell hip lift. Once an athlete has demonstrated the ability to efficiently perform each previous exercise and developed the necessary glute, hamstring and core strength, he/she can progress to using a barbell for added resistance. Because barbell can place a significant amount of pressure on the hips, an Airex pad should be placed under the bar to remove pressure and make the movement more comfortable for the athlete. The movements in this exercise are similar to those in the unweighted glute bridge. Body Weight Double-Leg Hip Thrust. This is an advanced, body weight exercise with the shoulders elevated by a bench or padded box and both feet flat on the floor Elevating the shoulders allows for greater range of motion than the hip lift, and when resistance is added, can significantly improve development in the posterior chain. The athlete starts in a seated position in front of a bench, ensuring that he/she is in a position where the edge of the bench is pressing in the thoracic region of the upper back. The feet should be no wider than hip-width and pointed straight or slightly turned out. The feet should be flat on the floor and positioned so that the knees are over the heels and not the toes at the top of the exercise. Proper spinal alignment is imperative because the shoulders are elevated which makes it easier to overextend the hips. Once the athlete is in position, he/she starts by pressing the feet into the ground and driving the hips upward, until the spine is properly aligned and there is a straight line from the knees through the hips and to the shoulders. Body Weight Single-Leg Hip Thrust. This exercise is similar to the double leg exercise in set up and execution except that the exercise is performed with one leg. The non-support leg can be extended position or bent at a 90-degree angle. Progressing to a single leg version of this exercise increases the strength required in the muscles of the posterior chain. Band Resisted Hip Thrust. The next progression is to add resistance to the exercise using a resistance band. Depending on what equipment is available, the setup will differ with regards to how the band is attached. A piece of equipment that is becoming more common in some weight rooms is the hip thruster. The hip thruster is made specifically for this exercise and has pegs on each side on which the band can be attached. Athletes who do not have access to the hip thruster, can attach the band to heavy DBs placed on each side of the body. The set up remains the same as in previous versions except that a band is placed across the top of the hips. As an athlete progresses in strength the resistance can be increased by using thicker and heavier bands and/or progressing to a single leg version of the exercise. 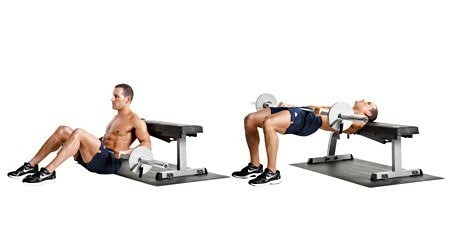 Weighted Hip Thrust (Double and Single- Leg). For more resistance, the exercise can be performed with a plate or DB. The weight is placed in a comfortable position on the top of the hips (double-leg) or hip (single-leg). Holding the plate or DB in proper position, the athlete performs a hip thrust with proper spinal alignment. With resistance is added, it is important that the athlete does not over-extend at the top of the movement to avoid placing unnecessary stress on the lumbar region. Barbell Weighted Hip Thrust. The most advanced version of the hip lift / hip thrust exercise is the barbell hip thrust. This is similar to the barbell hip lift except that range of motion is increased because the shoulders are elevated. An Airex pad should be placed under the barbell to ensure comfort throughout the movement. As more weight is added, the pressure across the top of the hips can create a significant amount of discomfort if proper precautions are not taken. This exercise requires a significant amount of posterior chain strength and core stability and strength. It is highly recommended that athletes progress through the previous exercises and achieve a relatively high level of strength to perform this exercise with proper technique and safety. 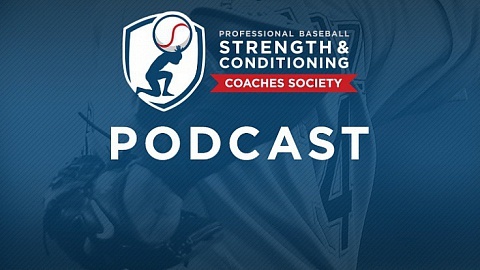 Dwayne Peterson, RSCC, is the AAA strength and conditioning coach for the Houston Astros.